Over ten years ago a reviewer wrote, in an article on Kazuo Ishiguro’s novel When We Were Orphans, which had then just been shortlisted for the Booker, that it was never easy to pin down an Ishiguro novel. After having read the novel a few months ago (I’ve had it in my possession for a very long time; one of those instances when one needs to nurture the experience necessary to enlighten a book I guess) and spending a great deal of time mulling over it, I think I’m ready to agree with him. In premise, Orphans is a detective story with a mystery at its heart: the disappearance of the narrator-protagonist Christopher Banks’s parents in pre-World-War-I Shanghai. After the disappearance of his parents, Banks grows up in England and, as an adult, becomes a prominent private detective and socialite in London. In the late 1930s he returns to war-time Shanghai on an ill-fated, deluded mission to solve the mystery of his parents’ disappearance, fuelled by the heroic and fantastic notion of rescuing them. The novel resembles detective fiction in structure, but the muscles and nerves mounted on it are anything but. Filled with memories, more memories, and interpretations of those memories, the novel is a Quixotic Zeno’s-paradoxical quest in more ways than one. Looking closely one can discern three layers to Banks’s personality: the child, the adult detective, and the memoirist. The child perceives and interprets the rather puzzling world of the adults (parents, parents’ friends, and friend’s parents) with a naïve and fabulous moral imagination that is utterly grey-less. His interpretations take on the form of role-play games that reflect his fears and desires. As an adult and a London-based detective Banks perceives the world through the rather constraining lens of logic and an imagination tempered by a western sense of order. 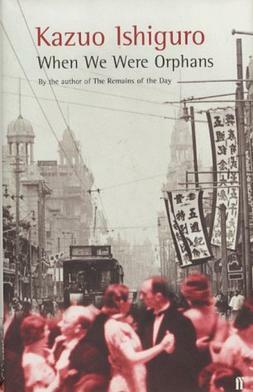 He analyses and interprets both his memories of childhood in Shanghai and the memories of his interpretations as a child. Eventually he realises that the naïve idealism of his childhood self, and the fears and desires embedded therein, continue to exert an overwhelming influence on his actions in spite of his ‘adult’ judgement. It is as a memoirist recalling, reminiscing, and mulling over his childhood memories, his futile actions as an adult unconsciously influenced by those memories, and his eventual disillusionment, that he achieves an uneasy sense of peace. Whether this could be interpreted as a Proustian conclusion is an open question. This entry was posted in Book Review: Fiction, Books, Notes on Literature and tagged Books, Fiction, Kazuo Ishiguro, The Hindu Literary Review, When We Were Orphans. Bookmark the permalink.